After noticing many people dangerously using their phones while crossing the road, high school student Jake Coppinger decided to develop a form of human-computer interaction that does away with a screen. To do this, Jake turned to the maker community of the world wide web to teach himself computer programming and electronics. In this inspiring and impressive talk, Jake demonstrates “Swirlesque”, the prototype he invented and built, which can control electrical devices with the flick of the wrist. 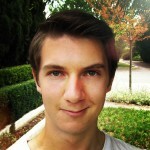 Jake Coppinger is a Canberra-based year 11 student with a passion for creating new technologies. Recently, Jake was awarded third place at the national BHP Billiton Science and Engineering Awards for developing &apos;Swirlesque&apos;, a new way of interacting with computers. From this competition he&apos;s been chosen as one of four Australian students to compete at the Intel International Science and Engineering Fair in California this May, the largest international pre-university science competition. Jake attended a Steiner school until year 10, then attended a specialised school program for science, mathematics and related technologies. Jake believes that there are amazing opportunities for young people to pursue their own learning of engineering and computers through hobbyist electronics that are taking the world by storm. Whilst he is looking to pursue a career between the fields of engineering and science, Jake also enjoys practicing the violin and producing short films.